I must say that the Alhikmat Dinner was a wonderful program and we had a beautiful evening. Thank you again for the invitation. 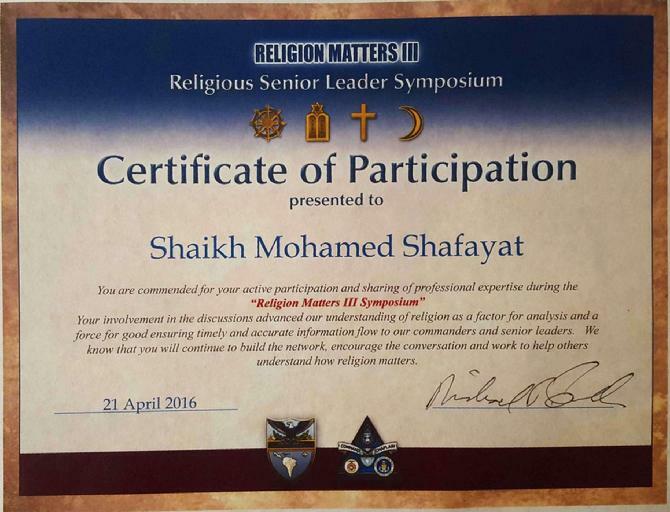 Please remember to include us every year as we commit to supporting the Shaikh and Al Hikmat in all endeavors. I want to say thanks for the recent video interview with Rabbi Moshe PItchon on your television program. I really enjoyed his account of going to school in Jerusalem at the Hebrew University, working for the Young Men’s Christian Association of Jerusalem, with a staff of employees mostly made up of Muslims. What a marvelous story! It is typical of the kind of generosity, understanding and friendship you promote. Thank you very much! I miss the times we had together with Chaplain Mike Lembke. He invited me down three or four times to be at SOUTHCOM. I always enjoyed spending time with you and the many other religious leaders at those gatherings. The panel we did a year or two back with Dr. Jim Wallace, Imam Asim Hafiz, Dr. Jacqueline Whitt and with many people of your community – it was very meaningful. I still have it on my video list. It was my heartfelt honour to meet you and to participate in the launch of the excellent work that Al Hikmat promotes. May Allah continue to guide and promote your every endeavour. David and I and my friend Magda were so happy to be with you at the Al-Hikmat Diiner & Award Ceremony on Saturday May 6th, 2017. I was so deeply honored by the award I received at the program. I was so impressed by the women - both presenters and other recipients. What great company to be in! You did a most outstanding job organizing such an event. Your son in laws were great MCs and your personal history was so touching. I had not known you as a fund raising but you were great! This was the first time I got to see the commissioner in action. An outstanding human being - especially considering his upbringing. I am looking foward to working with you both on the new interfaith initiative. Honourable Sheike Shifayat and your Wonderful Alhikmat team. Recently i have been viewing the sheikes lectures and viewing the website and as a result has brought great joy to my heart to see the extraordinary work of deen that the sheike is carrying out which is indeed worthy of compliment. When i was there Approximatley 15 to 20 yrs ago we were in the early stages but sheike was profound in his vision and intentions and MashaAllah today we see the fruits of his hard work and effort. May Allah grant you further strentgh and protect you from the evil eye and safeguard you and Darul uloom and may he make this effort a means of salvation Aameen. We are very grateful of this opportunity presented by your introduction on air of Okan International University & Life-Line Med Training. It is a pleasure to exchange ideas while passing the word of our education services. We are looking forward to be able to offer educational support to your community. It is an amazing media work that you do. Personally, I want to be thankful for your time and your own way of making comfortable interview time. All important points were covered smoothly. Thank you again. Please, forward the magazine information for the announcement details. I will email you tomorrow programmatic details for both schools. May God continue blessing your work. My name is Bro. Karim and am writing you from my home in the US Virgin Islands. I think I got a brochure at the Mosque here a few months ago as it was a Friday and Jummua where many other men had came. I am a student following the Prophet Muhammad (S.A.W) and I am still interested in learning more of the Arabic language. So, I would like a copy of the Traveling Dua. I had found some beginning books 1-6 grade level to borrow as I am interested in learning to count numbers and more words. I will accept $10, $20 credit but no more for now. I hope to hear from you. For the past twenty years or so I have been reading your Al Hikmat magazine. It has been a tremendous joy doing so for I have gained much of my Islamic education through my thoroughness in reading it. I have found that the magazine caters for people of different races and religions and this is surely a plus as the religion of Islam is for all of mankind. My husband, is incarcerated and introduced me to your publication. I would love to receive it and continue to grow in my wisdom and our Deen.Masha’Allah for the works you do. I am happy to watch Al-Hikmat TV. I love your magazines. Very interesting and mindful! You have a very helpful web site to Muslims as well as Non Muslims. Keep it up and our Dua’s are always with you. I would like to get your magazine. I would like to receive a copy of Al-Hikmat, which is one of the best Islamic Magazine. I’m writing to request to be put on your Da’wah Mailing List. Can you forward your next Issue to me and continue to forward them in a weekly or monthly basis. I will truly appreciate your publication and any other information that you have, Inshaa Allaah. I thank you and await your prompt response. I recently had the pleasure of viewing one of your old newsletter (2002). I really enjoyed it and would gladly subscribe with you. Please forward me a recent copy. In advance, may Allaah reward you for your efforts. Please mail the Al-Hikmat magazine. Thanks. I will like to receive a Prophets Genealogy. I am interested in your studies and as a beliver in the deen I would like to study more of your materials. We are lucky to have a wonderful website like yours for information on Islam. I would like to be added on your mailing list to receive the Muslim Magazine. Please sign me up for the mailing list. Thank you very much. Thank you for sending me the Magazine. I really appreciate it. It is great that you have all this informatiom on your website. May Allaah continue to bless you. My name is Ibu Askia Jahbreel Muhammad Ture and I heard a lot about Al-Hikmat Services from other brothers through my travels in prison. However, I was interested in receiving the magazines that I’m told I can receive free of charge among other things. Jazaak Allaah Khair! I would like to take this opportunity to thank you for the reading materials that you have faithfully donated to our chapel at Everglades Correctional Institution. The “Magazines” were well received and our inmates express their special gratitude for your thoughtfulness. Please keep us in mind for future donations. I would really like to receive a copy of the magazine, as I want to study Islam more deeply, Inshaa Allaah. I was blessed to receive and read one of your informative newsletters and Inshaa Allaah, I would love to subscribe. * It has always been a pleasure visiting your website. I enjoy reading your magazine. My name is Millie and I'm a regular reader of alhikmat.com. I'd like to thank you for the excellent information I've found on alhikmat.com; it's always a great pleasure to read your articles and I have subsequently become a loyal reader. I would like to join your mailing list in order to subscribe. Thank you very much. With your good personality you have contributed alot to spread Islam, Mashaa Allaah! Many “THANKS” for the plaque that honored me for outstanding service and dedication towards the uplifting of our community which was given to me at your Annual Dinner & Award ceremony on May 1st, 2011. I am greatly honored that I was one of the chosen awardees. I enjoyed the festive occasion and the warmth and love I felt from being with and speaking to, many of the fine Islamic ladies and gentlemen who attended. The children dressed in their Islamic flair were cute and beautiful, as are all the children of this world. With attendees of the Jewish, Christian, Islamic and other faiths, this ceremony truly showed, “WE ARE ALL GOD’S CHILDREN”, as I described in the new edition of my book titled, THE LAST “WAKE-UP-CALL” - ARE WE REALLY THIS STUPID? Nothing in this book is political. This book is strictly dedicated to hopefully stopping an all-out nuclear religious war that will eradicate all of mankind. It could happen and soon. I do hope you and your family are enjoying good health. May Almighty and Merciful ALLAAH protect us all. Mr. Frank J. Mazzeo / Florida U.S.A. I give all praise to Allaah. I pray that all is well at Al-Hikmat. I want to say thank you for adding me on your mailing list for the Al-Hikmat Magazine. Your magazine is insightful and I enjoy reading it. I received my new issue of your Muslim magazine. Thank you for making me a part of it. Please send me your magazine. I’m pleased to see your website. Please keep me informed/updated with your magazine. I am very happy to connect with you through the website to have more instructions on Islam. Please make it possible to send us some good books on Islam. Thank you your wonderful website. I really appreciate it and will like to be part of your mailing list. Thank you for the magazines, that we receive monthly. This is my first time of getting into your website. I will like to request for the Muslim magazine. I enjoy learning from your website. Please send me your magazines through mail. Thanks you very much for sending me your magazine. It is quite informative! I am presently confined in the Florida Department of Corrections and recently as of two days ago, the institutional Chaplin sent a volunteer to see how I was doing in confinement unit. The chaplin sent me two Al-Hikmat Monthly Magazines (Feb. 08 & June 10) issues. I found your magazine to be very informative, positive, and inspirational. May the grace of Allah find you well today. 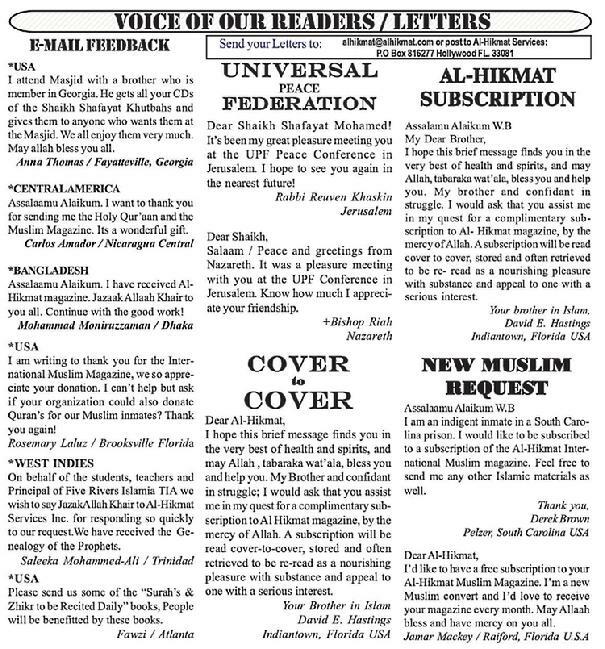 I am writing to you today because I love the publication of the Al-Hikmat monthly magazine. I will like to say thank you for sending me the Al-Hikmat Insight Magazine for free of charge and I am very grateful for another favor from Allaah. I have changed location and I would like to receive the Al-Hikmat Insight at my new location, Inshaa Allaah. Thank you again at Al-Hikmat Insight. Please send me the Monthly Muslim Magazine and Khutbahs. May Allaah bless you for all your hard work. Thank you so much for the Islamic Channel. I always wanted an Islamic channel. I love the Hadeeth and the recital. I wish the Daytona Beach Mosque taught the way you teach. Masha Allaah you do very well. May Allah bless you. I would like to take this opportunity to thank you for the reading materials that you have faithfully donated to our chapel at Everglades Correctional Institution. The “Newsletters” were well received and our inmates express their special gratitude for your thoughtfulness. Please keep us in mind for future donations, and may the Lord make all grace abound towards you in all wisdom and prudence in His love. Greetings to my fellow Muslim brothers and sisters of Islam. My name is Byron Mobley and I have been on my Islamic Journey for about 5 years now. Another brother has introduced me to your Monthly Muslim Magazine and I’m overwhelmed by the insights and wisdom it provides. I am incarcerated right now in Florida Department of Corrections and unfortunately I am indigent. I would love to receive your monthly magazine to strengthen my Islamic Journey. Is there any ways that this request may be possible? May Allaah (S.W.T) rain many blessings on you and forever keep Islam united! We would like to receive your monthly free magazines. Please add me on your mailing list to receive Al-Hikmat Magazine. Please send magazines to my address. Thank you! I went through your website and was impressed by your programs and activities , may Allah bless you. Al-Hamdulillaah, your magazine is a very good guidance to all. Please send me latest info of whatever you have. I want to subscribe to the Monthly Muslim Magazine for our inmates here at the jail. I would also like information about paperback books we could also order for them as well. Please send me the Al-Hikmat magazine. I would like to join your mailing list and receive your Muslim Magazine. Very nice to see the Islamic Website. *PAKISTAN - Your magazine is one of the most informative one, Masha Allaah. My name is Ahmed Abdullah and I’m writing to your blessed newsletter to say that I enjoy very much reading the articles. Here at this institution we lack many resources about Islam. 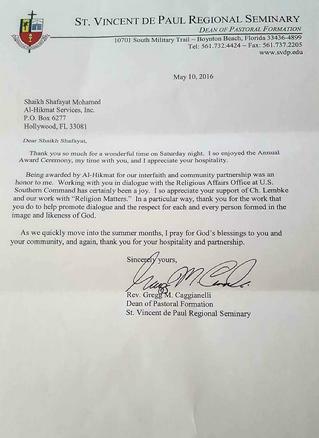 So I am requesting if you can place me on your mailing list to receive Al-Hikmat, please. May Allaah bless you and your families and continue to aid you and keep us all on the straight path. I am also seeking a Qur’aan with commentary, if I am able to receive a had cover please, as I am hungry in my journey in Islam to learn much more, Inshaa Allaah. 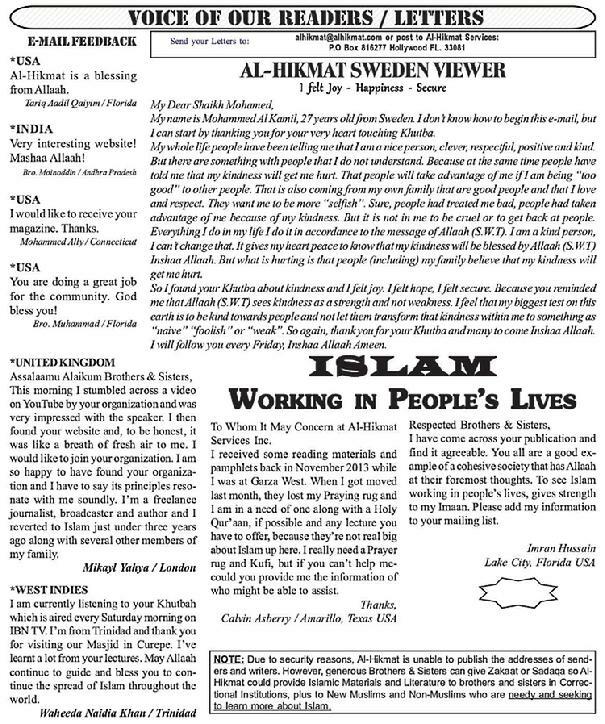 I was wondering if you could place me on your mailing list for the Magazine (Al-Hikmat)? Your magazine is insightful and I would like to read more of it. I thank you for your time. May Allaah bless you all. Comments: It’ll be highly appreciative if you’d kindly send me some complimentary copies of your Monthly Muslim Magazine “AL-HIKMAT’’, free of cost and without any obligation. Thanks in advance and Jazak-Allah! *USAPlease send the Monthly Muslim Magazine through regular mail. *NIGERIA I wish to receive current news on Islam in general through your website. I was in Argentina lecturing until yesterday, and I apologize for my late response to the gracious invitation to your Annual Dinner tomorrow. I was very touched and overwhelmed by the Award you offered to present to me at the Al-Hikmat Dinner. 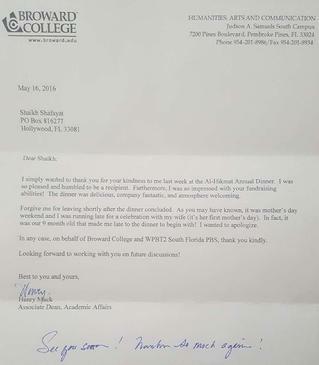 I certainly did not expect such a great honor from your distinguished Institution. Unfortunately, because of my Shabbat observance, I cannot attend the Award Ceremony. I do not drive on Saturdays until after sunset. I wish I could be there with all of you. I am looking forward to working with you on behalf of a better understanding and cooperation between Muslims and Jews in America. As I have told you on several occasions, the world would be a better place if we had more religious and spiritual leaders like you. God bless you! I am new in the USA and I really appreciate your services. Please post your monthly magazines to me. I believe this type of literature and audio-visual aid, would help to propagate Islam in a simple and more undstanding way. I would really like to receive the copy of magazine as i want to study Islam more deeply, Inshaa Allaah. *I would be glad if you could kindly add my name and postal address in your mailing list to enable me to receive your free monthly magazine. I count on your usual co-operation. *I found the website with great information about Islam. May Allah be pleased with all the organizers. I want to subscribe for the Al-Hikmat to receive your Monthly Muslim Magazine. I would like to know what is the cost of the subscription Magazine. I reside in India. Kindly do let me know. *We are lucky to have such a wonderful website for Islamic knowledge. *Very enlightening, spritually captivating and perfect wisdom in your magazine. *As Salamu Alaikum. I am very fond of reading Al-Hikmat. Unfortunately, I cannot get any Al-Hikmat here since I moved. Please try to send me one copy monthly. I am most thankful and would like to make contributions to your wise and noble effort. Thank You. S.Khan / San Antonio, Texas U.S.A.
*Can I have magazines in French and the Bible through mailing. Celdieu / Ft. Lauderdale, Florida U.S.A.
*It takes a good personality to contribute to spread Islam like your organization. I would like to receive any latest publication on Islamic affairs and lectures on how to live this life. *Can you send me publications & audio visuals free of cost, please. *Muslim brother who is interested in Islamic Studies from your website. *We are lucky to have a website like yours, to learn more about the true religion, Islam. * I would like to request the Traveling Dua to be sent to me. I also enjoyed Shaikh Shafayat presentation at Beth El Synagogue. -Dr. Herbert G. Otter / West Palm Beach. *I would like to receive a 99 Names of Allaah book. I am looking for materials to help me learn about Islam. *Kindly send a few copies of Sadaqa Jaariya materials for distribution. We will really apprecite it. *If you can please add me on your mailing list to receive the magazine, I will really appreciate it. *We are lucky to have a wonderful website like yours for information on Islam. *With your good personality you have contributed alot to spread Islam, Mashaa Allaah! *I want to study your monthly magazine. *A very informative website. Keep up the good work. *As Salaamu Alaikum, I would like to receive a free copy of SURAHS ZHIKR DAILY. Also a copy of TRAVELING DUA in ARABIC transliteration English. *I like you guys magazine so much that I’m getting it sent to me in West Virginia because I moved from Florida and I can’t receive any from the Masjid that I was getting them from (Masjid Jamaat al-Mu’mineen) so thank you and peace be unto you. *Very enlightening, spiritually captivating and perfect wisdom.